Hey there friend! 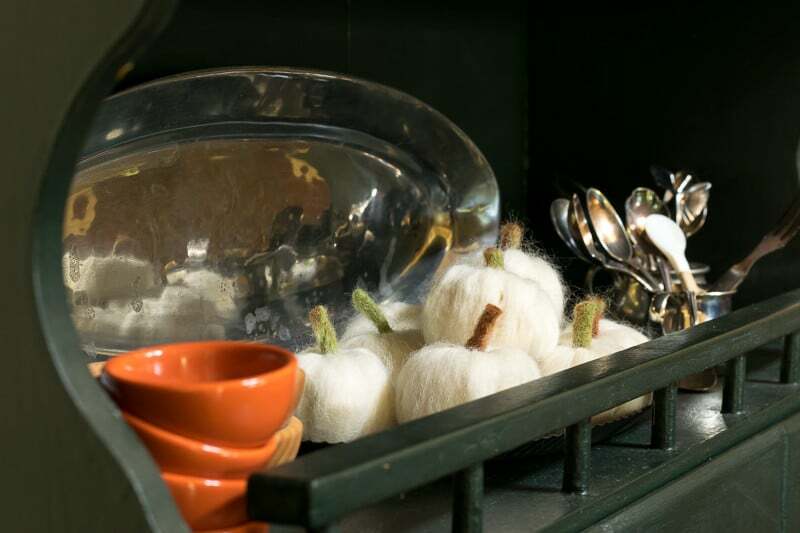 If you stopped by my Fall Open House last week you saw my ‘oh so darn cute' wee needle felted pumpkins. I'm back today with the how-to so that you can whip up a batch, bevy, flock (what do you call a bunch of pumpkins?) of these cuties. I initially planned to make a whole bunch of wee orange needle felted pumpkins, but after I made 8 of the orange ones I realized that I really wanted white ones. I'm decisive that way. I attached the pumpkins with the thread as opposed to glue because I thought I might want to use them for something else in the future. I already had some Brown from a previous project, but this would work. Foam Pad. I went to my local fabric/upholstery store and purchased a scrap piece of dense foam. But this would work if you don't have access to foam where you live. Wrap your scrap yarn around two fingers several times, then remove the wrap from your fingers and wrap the yarn perpendicular to the yarn you wrapped first. You are trying to form a fat disk. Keep turning your disc while you wrap a couple of times to get your disk. Rip off a couple chunks of yarn, about 4-5 inches long and wrap your yarn disk, using your needles to secure the roving to your disk. Once your base is 1/2 to 3/4 what you want for your finished pumpkin size, you can start attaching the segments to get the contours for your pumpkin. Use your needles to make a good indentation where you stem will go. Attach your ‘sections' just outside of your indentation. The roving should be about twice as long as the length from the indentation to the bottom of your pumpkin. You will fold the roving underneath and attach with the needle where it is bent in half to the bottom of the pumpkin. I prepared a video to show you how to make these pumpkins from start to finish because some things are just better explained that way! You can see that video towards the bottom of the post. Once your pumpkin is the size you want, start to work on your stem. Rip off a chunk of brown or green or a combination of both. If you are working with 2 colors, give it a twist to blend the colors. Then work your needles up and down the ‘stem' compacting the fibers. You will notice that the fibers will stick to the foam, especially when you first start out. As you continue to work the fibers will compact and won't stick to the foam as much. Continue to turn the stem so that you needle all sides until it is well compacted, stiff and cylindrical. Cut off a wee bit for the stem length that you want. Use one needle to hold your stem to your pumpkin while you use another needle to attach the stem with a couple of good jabs. This video will show you the process from start to finish. For the orange ones…I just added a strip of the darker orange between each of the segments, with lighter strips on top of the segments sometimes as well…I just mixed it up. I even added a few strips of green here and there as well. If you think you'd like to give these mini needle felted pumpkins a try, bookmark this page or pin it for your future reference. Ahhh…I can’t wait to make these! They are so stinkin’ cute! Getting ready to send you some happy mail! I am in love with these little pumpkins. Thank you for the great video. I am a visual learner so it was just what I needed. Thank you for sharing! I am so glad you are going to give these a whirl. They are quick and fun…just be sure to protect your fingers! Happy Wednesday my friend. Oh my goodness!! I so wish I had the talent & patience to make these! I saw them on your blog & just fell in love. They are so adorable! Maybe someday I will give it a try. I would love to have a whole basket of the white ones & the acorns!! Michelle, I’ve seen your skills…there is no doubt in my mind that you could easily whip up a batch of these little cuties. Seriously, very easy. Give them a whirl. 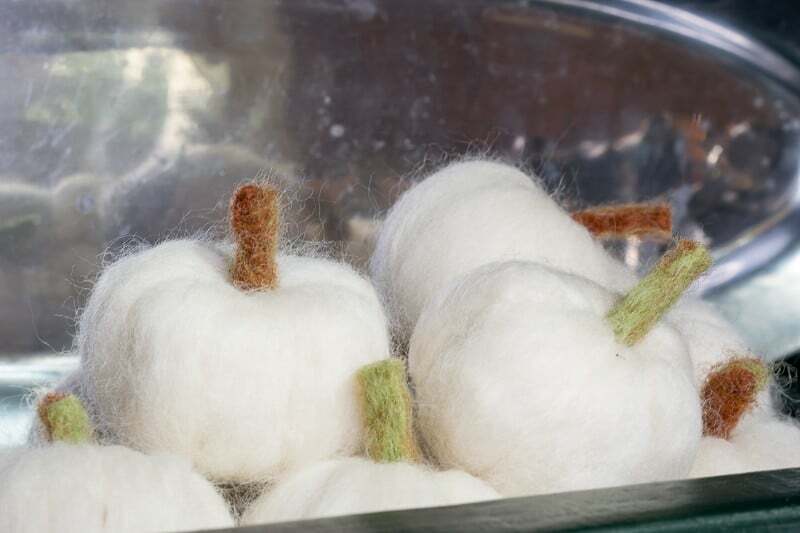 Thank you, Lynn, for taking time to show us how to make the cute, cute felted pumpkins! The video was perfect! Hi Sherry…I am so glad you found that video helpful…some tasks are just too hard to explain when a video will do the trick much more efficiently. Thanks so much for visiting today my friend. Wishing you a fantastic weekend. Lynn, You make these look so easy and I can’t wait to start making some! Thank you for the video, it really helps! Truly, very easy Carol. I put your ‘happy package’ in the mail today so you’ll be able to give them a whirl yourself soon. Thank you, my friend! Hugs! Oh, my hat Lynn!! These are just the cutest!! I can’t wait to try making some of these cuties!! So fun Sam…and so very easy. You’ll have plenty of time to get them prepared for your fall! Oh my goodness, I was mesmerized by your video! I have always wanted to know how to make these! Your video is awesome and the pumpkins are so cute! Aw thanks Janine…So very easy and fun to have for the season. Wishing you and your family a lovely weekend my friend. These mini pumpkins are so cute. I can think of all kinds of uses for them. I have the felt and the needles but have never tried to play with the supplies yet. Thanks for sharing. Pinning. Hey Leanna…you could whip out quite a few this weekend! Have fun and thanks for stopping by. Oh my goodness! These are just adorable! I love this project SO much! I have never done something like this (felting) but I have arm knit with that same beautiful wool and I have some left over! I really want to make these! I just finished watching your video and it was so helpful! Thank you for your great idea and the wonderful tutorial! First off…so nice to ‘meet’ you and join you in this little blog hop. These little punkins come together so quickly, since you have the roving you could find the needles at Michaels or JoAnn’s and have quite a bunch before the weekend is over. And I’m so glad that video was helpful…much easier to understand than if I had tried to write it all out. Wishing you both a lovely weekend. Wow Lynn, these are so adorable. Thank you so much for the video, I was having a hard time picturing the process from the pictures. I’ve never seen this before but I love it! Hey Toni..so glad you found the video helpful. I know I am a visual learner…you must be too. Makes it so much easier to see it being done. Hey Tara…So glad you are going to try to make them. Really so easy…just be sure to protect your fingers! Those needles are sharp and have barbs on them. Thanks for stopping by and leaving your kind comment. These are the most beautiful little pumpkins, they are so sweet Lynn! I don´t know if I´d get them looking like this, but I´d love to give it a try! Thanks for the great tutorial! Aw thanks Katrin, they will surely fit in with your Scandinavian decor! And there is no doubt in my mind that you can do it…really so easy. Oh Lynn these are absolutely the most adorable little pumpkins. I have always wondered how to felt. I always thought that you started with a piece of felt, and wondered how in the world something so cute was made from felt sheets. Lol. It wasn’t. I would love to try felting someday, now that I know what it is and it really looks pretty simple. Thanks so much for the video without it I would of still been confused, but it’s really clear on the technique. Linda, it is seriously easy! No doubt with your skills you would have no problem. Hope you have fun whipping out a bunch of them.